Tesshin started his talk this week by recounting how he brought his children to a farm stand so that they could “adopt” some pet chicks. The idea was to teach the children the responsibility for caring for another living being. The children were very excited and named each chick and then played with them for the entire day. After a day or two, the children got bored with the chicks and went on to other things. On the fourth day, Tesshin noticed that one of the chicks had died due to lack of food and water. He gathered up the children and showed them the dead chick. What is the lesson here? Of all the children, his eight year daughter cried but then had a realization. She was a part of the cycle of life and death. 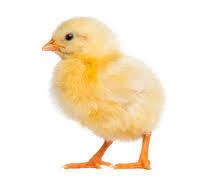 Her actions could cause life or death and that she was not separated from the death of the chick. According to Tesshin, this is the moment of opening and the moment of realization for his daughter! Do you see the difference? The second question exposes the evil nature of the second son because he separates himself from everything and everyone. In Buddhism, we believe this separation is the greatest delusion and one of the key sources of suffering. When we say there is no “self” it is this disconnection from everything that we are trying to get at. It is a reminder that one is not really separate from the world around us. Like when Tesshin’s daughter realized that she was part of the cycle of life and death and that her actions mattered. “Non Duality” stopped becoming an intellectual concept and became REAL for her. Today, we see all around us the effects of this separation. We see this when we judge others without trying to understand and help. We see this when we stop listening to people we disagree with. We see this when we attempt to “signal our virtue” with simple slogans rather than digging into the complicated issues of the day. Lastly, we see this when we simply abandon challenges and look for ease and pleasure. Our practice is one of enlightenment or coming face to face with reality. It is never about what “YOU out there” think, rather it is about what WE must do together in the single unified world we inhabit to alleviate suffering of all beings. Your actions matter – and they can have huge effects on others. Evil is tuning your eyes away and thinking that this is someone else’s problem. Tesshin wrapped up by wishing everyone a happy Easter and Passover. A muscular samurai approaches a Zen master to ask for wisdom on Heaven and Hell. The warrior responds that he wants to get into heaven. The samurai is not used to someone talking to him like this and becomes very angry. Without thinking he pulls out his sword and is ready to smite the master. The samurai instantly understands and bows deeply. In the same calm voice, the master says, “Now the gates of heaven are open to you. Do you understand what just happened? The warrior had to make a choice. It is a choice we all really have to make. What do we value? On the one hand, we have our status and accomplishments – namely our story which we will do anything to protect. On the other hand we have spiritual understanding. In the parable we have this wrinkled old man standing in front of a mighty samurai – brave beyond belief due to his mastery of reality. With endless love for all beings he simply “states it as it is.” If you cling to your story the gates of hell will open up to you. The warrior is stuck – he has hit a barrier to understanding which the old master knocks down with a single sentence. Who is the more powerful one here? 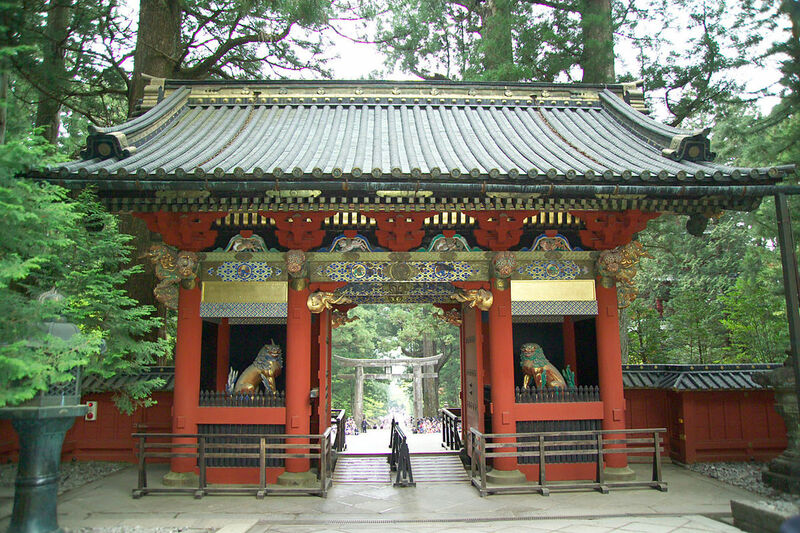 Commonly in Zen temples, there is a gate called the “Mon.” A new student arrives at the temple gate and announces his desire to know the truth. Immediately, the gate is closed to him and he is told to go away. Remember, nothing is done in the training for capricious reasons. The young student does not know it yet, but the training has already begun! Is this gate a real barrier? Is there anything intrinsic in that gate at that time which is preventing the student from knowing suchness? It is just a gate, after all – wood and metal. Here is the first test of Zen. Can you distinguish a physical barrier from a spiritual barrier? Many students fail and leave the temple before the waiting period is over. They falsely believe that the something is being withheld. How sad! Tesshin reminded us that the real barriers to spiritual understanding are in your own mind and not “out there” in the physical world. The temple gate is nothing and can never keep you out if you understand! The barriers are what we bring to practice. It is interesting that the first set of koans which we study is called the Mumonkan or “Gateless Gate.” So what is a gateless gate? How can nothing be the greatest barrier to understanding? How can nothing be greater than a wall constructed of mile thick concrete? Mu is nothingness – so what is holding you back??? The “gate” manifests when you cannot sit down to practice. What stopped you? The “gate” manifests when you “buy into” your own story. You know better! For the samurai the gate manifested when he became enraged at the seeming disrespect of the master. He changed, can you? Tesshin wrapped up by saying that in practice there is no barrier because there is nothing in practice which is outside of your own mind. The challenges and blockages are in your own mind and only you can transcend them – and when you do the gates of heaven will be open to you as well. One of our senior students, Barbara Green, gave the Dharma talk this week as Tesshin was away traveling. The topic was the first patriarch of Zen. Bodhidharma was a Buddhist monk who lived during the 5th or 6th century CE. He is considered the first patriarch of Zen because he introduced Zen/Chan to China. It is believed that Bodhidharma was born in either central Asia or India where he learned Buddhism and then migrated east to China. Buddhism was already thriving in China at this time, but Bodhidharma brought a new message of an austere practice which operated “outside of scriptures” and relied on intuitive understanding of reality. 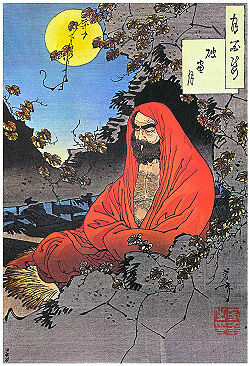 Bodhidharma is normally depicted as an irritable bearded monk. Some sources also call him the “The Blue-Eyed Barbarian.” This label probably has more to do with him being a foreigner in China than any real physical appearance. However, it is known that he taught a very strict form of Zen and gave no credence to fools or those merely casually interested in the Buddhist practice. In fact, it is said, that when he arrived in China, he encountered Emperor Xiao Yan. The king asked how much merit he had accumulated by supporting Buddhism and building many temples. Bodhidharma said NONE. All your worldly deeds mean nothing if your true desire is to find the noble truth. 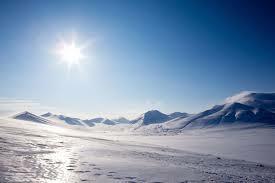 The king asked what is this noble truth – to which the Zen master could only respond emptiness! The frustrated king then asked, if emptiness is the only truth, who is standing in front of me? To which Bodhidharma answered – I know not! If you think this sounds like a Koan – you are right! It is the first Koan of the Blue Cliff Record! There are also many legends about what happened during those nine years of intense mediation. For instance, it is said that to prevent himself from falling asleep during meditation – Bodhidharma cut off his eyelids!! (Not something we suggest – even if you find yourself dozing off during a zazen session!!) It is said that when his eyelids hit the ground they became tea plants – and this is why tea is so connected with Zen practice. While the stories such as these are entertaining and interesting, there are real lessons for all of us in Bodhidharma’s life. First, I think we can take inspiration from his dedication. Many of use struggle through a single zazen session – imagine going for nine years straight. However physical endurance is just the beginning. I think we can also take inspiration from his single minded focus to solve the question of life and death – namely what is this “suchness” or the reality we find ourselves in. What does it all mean? Lastly, Bodhidharma focused on the actual experience of suchness and not on academic study, devotional rituals, or doctrinal debates. For him it was about the intuitive grasp of “Buddha Mind” through concentrated meditation. It is this active rather than academic effort which so characterizes Zen to this day. Again, special thanks to Barbara Green for putting together such a wonderful talk! The master said, “You have only to enter the secular, enter the sacred, enter the defiled, enter the pure, enter the lands of all the buddhas, enter the Tower of Maitreya, enter the dharma realm of Vairocana and all of the lands everywhere that manifest and come into being, exist, decay, and disappear. The Buddha appeared in the world, turned the Wheel of the Great Dharma, then entered nirvana, yet no trace of his coming and going can be seen. Though you seek his birth and death, you will never find it. Then, having entered the dharma realm of no-birth and traveled throughout every country, you enter the realm of the lotus-womb, and there see through and through that all dharmas are characterized by emptiness and that there are no real dharmas whatsoever. There is only the man of the Way who depends upon nothing, here listening to my discourse – it is he who is the mother of all buddhas. Therefore, buddhas are born from nondependence. Awaken to the nondependence, then there is no Buddha to be obtained. Insight such as that is true insight. What is this Koan trying to convey to us? According to Tesshin, nothing more than radical transformation! What does that mean and how do we know when this happens? Tesshin mentioned to us that there is a lot of talk about being “radical” in today’s culture, but most of it is nothing more than simple “protest.” It is done to make a statement while looking enlightened to other people. Here the koan is explicit – transformation can never come from the outside! “There is only the man of the Way who depends upon nothing” Transformation must come from within us – it is never in reference to anything external to us. To elaborate, Tesshin recounted how as a graduate student, he was required to present his thesis to the president of the university in order to get a diploma. Tesshin and a group of students burned their thesis instead of presenting as they disagreed with the university in its support of military research. Due to this action they did not receive a diploma and did not walk in graduation. (However, he did note that he was awarded the degree) So is this radical transformation or simply making a statement? 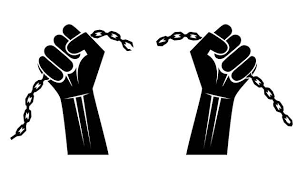 It is clear that while this action is laudable it is NOT radical transformation. The university may have slightly changed its actions regarding the military, but the students went on and worked in the current society and implicitly accepted its norms and requirements. Another example Tesshin gave is when the Pope washes the feet of inmates? Is this radical transformation? It is a beautiful ceremony and serves as a great teaching moment for church followers – but it does not break through any real barriers of belief – it only reinforces the message of the church. This action is relative to and for the follows of the church. It makes them believe that their leader is “good and just.” What if the Pope washed the feet of Putin or Kim Jong-un? What would the followers think then? What assumptions or cherished beliefs would that action break? Now we may be getting somewhere!! Do they really understand the message of the Dharma? Do they have a burning desire to save all beings by teaching? These are the correct questions!! Has the student undergone radical transformation or are they simply looking for an accolade from someone outside of themselves? If the student WANTS transmission, then they have completely missed the whole point and really could never receive “real” transmission. It is the same thing with any type of radical change. Your reputation is beside the point! Radical transformation is not a 1st place ribbon. It is not “virtue-signaling.” It is a commitment to save all beings. It is teaching the way. It is delivering 100% of yourself everyday knowing full well that your efforts are only a drop in the ocean, but you are still willing to do it day in and day out. Radical transformation is applying yourself to this hopeless goal with everything you have. Tesshin closed by reminding us that the koan is clearly pointing to this foundational truth in our practice. This game is commonly given to corporate groups during team building exercises. It is also given to school groups and Boy Scout groups. What commonly happens is that people quickly come up with a plan to use the map and compass to leave the crash site and set out for the nearest town on the map which is 30 miles away. In this plan the map, compass, gun, and ax are the highest rated items. This seems like an obvious solution – right? It may seem this way as this is the most commonly selected plan and list of items. However, this plan receives the LOWEST survival score! Remember, the plane crashed in the arctic. Most people are not able to hike 30 miles in these conditions even assuming that they could use the map and compass correctly. Tesshin emphasized how most groups come to a snap conclusion. He suggested that in situations like this, the best thing to do is to STOP, breathe, and take the time to carefully consider the situation. First, consider that all flights are tracked by air traffic control. This means that most likely, the authorities will quickly realize that there is a problem when the plane disappears from the radar. Next, consider that the plane fuselage will provide basic shelter from the elements. After some consideration, it probably makes sense to stay put and attempt to survive rather than braving the arctic for 30 miles to get to town. This is very difficult to realize for most people as they feel that they must do something – anything – and doing “NOTHING” appears to be totally passive. So with this strategy, our priority list of items changes quite a bit. The map and compass are not important. The Crisco is important as it can be used as fuel and calories. The lid of its can makes a great reflector which can be used to alert rescue parties. The lighter can generate sparks which can start a fire with the newspapers. The chocolate is a source of calories. Now, of course, Tesshin would NOT suggesting getting drunk on the whiskey while waiting for the rescue party, but it could be used as a fuel as well. The teams which put together this plan and item list always score the highest in suitability! So why would Tesshin use a survival game as a subject for a Dharma talk. He did this to remind us that our most important survival tool is our minds! The key to winning this game is not jumping to action immediately. It is slowing down, breathing, and thinking through all scenarios. It is the same thing in our everyday life. We must slow down and understand what our real goal is. Why do we do the things we do? Are they contributing to our happiness? Do these actions or things eliminate suffering in our life and the life of others? If they do not, then they are leading us in an unskillful direction. Our practice of mediation serves as training for just this skill. We learn to control our mind. This allows us to slow down and make better decisions, suffer less, and lead happier lives. Tesshin wrapped up by asking everyone in the group to show solidarity with the Hudson Valley Islamic Center by leaving flowers. As we all know there was a terrorist attack in New Zealand this past week and we all want to show our support. Information on the HV Islamic Center can be found on their facebook page. First of all, we all want to welcome Tesshin back after three weeks away from the Sangha. 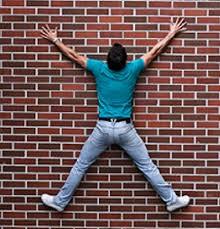 The topic of this week’s talk was what happens when we “hit the wall” in life. To illustrate this, Tesshin contrasted two very different individuals. The first was a terminal cancer patient who sought solace from a Buddhist priest. The second was an abbot of a Japanese monastery who decided it was time to retire. Tesshin started with the cancer patient – let’s call him “Jay.” He is 70 years old and has always been interested in “new age” pursuits like mindfulness and meditation. Upon hearing that he had cancer, Jay completely fell apart. He refused “modern” treatments as they did not “jive” with the holistic and organic lifestyle which he preferred. Tesshin was struck by how “lost” Jay was and it was clear that he was in denial about his condition. Jay would frequently state that he had “no energy” to deal with his condition and refused to make serious and necessary end of life decisions. Jay would often quote Alan Watts and ask what Watts would do in this situation. Tesshin had to remind Jay that Watts was not in the room and that Jay needed to make these decisions himself. Muhō’s video makes it very clear that this decision was not rash. It was thoroughly thought out and Muhō has made plans for a successor to follow after him at the temple. He realizes that it is no longer skillful for him to run a temple and it is time for others to take on this responsibility. So what does it mean to be “done” and is there a way to “be done” skillfully? Tesshin was addressing this exact point in this week’s talk. Muhō is at the end of his practice as an abbot. He has clarity. Jay is at the end and he has no idea what to do. What is the difference between these two people? Simply stated, Muhō practiced Zen authentically with his entire heart, body, and mind while Jay simply imitated what he thought the practice looked like. Muhō’s mind was stable and clear by virtue of many years of practice. As such, his decisions were clear. Jay never really practiced, and when he hit the wall with his cancer diagnosis, he was totally unprepared. Why is this important? In today’s modern age it is very easy to “consume” Zen. One can go to a spa to “get the Zen experience.” There is “Zen music” available on youtube. There are numerous “Calm” Zen apps available for your smart phone. The problem is that when we really hit the wall, this “Ersatz Zen” will not help! Our mind is wired for suffering, attachment, and delusion. It takes real work to unwire it. This cannot be done with an app or a trip to the day spa! It is accomplished with consistent practice on the cushion working to unwind the delusions of our mind. Tesshin asked how does one know that the practice is working. Ask yourself – does one bad event ruin your entire day? Does one argument at home or work cause you to make decisions which lead you down a karmic path of suffering? Do you have the stability to handle real tragedies of life with care and compassion? Can you determine clearly when something is done and it is time to move to something new? Tesshin wrapped up by reminding the group that we have something very special in the West – namely lay Sangha’s doing authentic Zen practice. In Japan, one must commonly ordain as a monk to do serious Zen training. He reminded us that the time we spend on the cushion will help us when life deals an unexpected blow. For this, and his teaching, we are truly lucky. Tesshin was traveling this week so one of our senior students, Barbara Green, graciously offered to give a talk this week on the Sixth Buddhist Patriarch. It is said that Huineng had been an illiterate laborer. One day, while listening to someone recite the Diamond Sutra, he suddenly became enlightened. After this, it was suggested he attend the monastery of Hongren – the 5th patriarch. The Fifth Patriarch was getting old and needed to decide who would carry on his lineage. To decide the issue, Hongren proposed a poem contest for his students in order to demonstrate the stage of their understanding of the essence of mind. 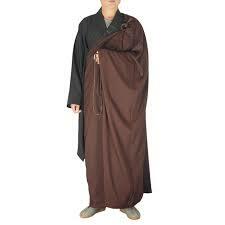 He decided to pass down his robe and teachings to the winner of the contest, who would become the Sixth Patriarch. So that no dust can collect. What place could there be for dust? The followers who were present were astonished by the work of an illiterate “nobody.” Being cautious of Huineng’s status, the Patriarch wiped away the stanza and claimed that Huineng had not reached enlightenment. However, on the next day, the Patriarch secretly went to Huineng’s room and declared “You are now the Sixth Patriarch! Save as many sentient beings as you can, and spread the teachings so they will not be lost in the future.” Huineng, knowing that the other monks would be jealous left the monastery to wander and teach. The story of Huineng has much to teach us. According to the traditional interpretation, the two verses represent respectively the gradual and the sudden approach to enlightenment. This is a common question in the Buddhist tradition. Can someone become instantly awakened or does it grow steadily over long periods of time. The group discussed this question and the general conclusion reached is that it really does not matter. It is more important for students to start on the path and stay on the path rather than to worry that things are not happening fast enough. Another topic discussed is our preconceptions about status and achievement. Huineng was not a high status student in the monastery, yet it was he who mastered reality, the mind, and everything! How many times do we discount someone because they do not fit our “assumptions” of what success looks like? Even worse, when we are surprised by this success, we get angry and act to destroy the unexpected person’s success. Why did Huineng have to leave the temple? What is the lesson here for us today? Again, we would like to thank Barbara for her careful research and lively talk. Tesshin began this week’s talk by mentioning the Japanese consultant Marie Kondo. Her contribution is the particularly Japanese way of “Tidying Up.” (For those interested, her website is https://konmari.com/) What is most striking about her method is the practice of picking up each object and asking – “Does this object spark joy?” If the object does, we keep it otherwise we get rid of it. Most importantly, however, even the objects we decide to “part ways with” we are encouraged to THANK! So what does it mean to thank an inanimate object? Do “things” have anything to teach us, and if so what? Here Tesshin was very clear – your reaction to the inanimate objects says quite a bit about the state of your mind. Do you find thanking a ski pole found in your basement untouched from your college days ridiculous or do you find it inspiring? Tesshin reminded us that Buddhism stresses the interconnectedness of all things. The practice of taking the time to relate to objects is a teaching tool, or skillful means, of reminding us of this power of connection. At some point in time you made a connection with that ski pole – enough of a connection that you acquired it. Now, perhaps in your current circumstances, you no longer need it. (Buddhism teaches us not to cling, after all!) So discarding objects we no longer need is OK; however there is real power in thanking the pole before letting go. In essence, you honor your past and realize that in some small way this object was part of that. After the thanking simply let it go. Keeping the pole beyond this point would be a form of clinging – which we know is not skillful. Tesshin next mused about how objects are part of your past and why the connection to time and place is so important. Objects form part of the “gestalt” of a place and time. This gestalt is critical to a well lived life free of suffering. Think about well-functioning places – perhaps a zendo or a well-designed office. Every object in that space is working together to achieve a specific purpose. In the Zendo we prize simplicity so that we can focus on the mind. We may have a simple Buddha statue to remind us of the Dharma, cushions to support our zazen, and a teacher at the front to help us when we stray. In the office, however, we would have desks, chairs, computers, and bright lights. These objects would not be useful in a zendo as they would be a distraction. 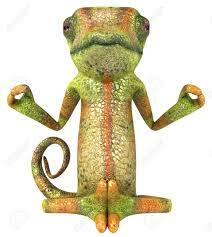 The most skillful thing to do would be to remove them from the zendo. Like place, we see the same thing at various times of our life. In youth, certain objects were critical for our joy and happiness. Later in life, the cast of characters change. 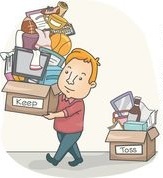 Our practice, and what Marie Kondo is hinting at, is to simply recognize this and make sure we part ways with objects no longer bringing us joy by thanking them and then letting them go. This should be a happy, grateful, and somewhat “wistful” experience – not one filled with pain and anguish. Tesshin wrapped up the talk by reminding us about the “Buddha Nature” in all things – sentient and insentient. 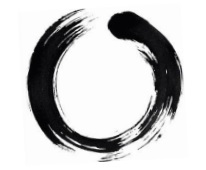 There are many koans which test the student on this exact point. He again reminded us that how we relate to the things all around us goes a long way to refining our understanding of life, reality, and the Dharma – the exact lessons which all these koans are trying to teach us! Tesshin began this week’s talk musing about how our current “addiction” to technology and social media are affecting society. He recalled a recent program where he was teaching mindfulness to Boy Scouts. Many of the boys were really challenged by sitting still for ten minutes. Even the parents could not believe their children could go for a few minutes without touching their phones. We must begin to wonder if we are all losing the ability to focus and concentrate with the constant distraction of our tech tools. Tesshin next asked the group if we thought this was a new phenomenon? Of course it is not! Social media, video games, and even TV are simply a new manifestation of a problem which has been with humanity since the beginning. The Buddha saw this problem 2500 years ago – long before any of our modern “conveniences!” Back in those days, the Buddha intuitively realized that the mind was susceptible to distraction, emotions, fear, greed, and lust. He also understood that with proper training these urges could be integrated and managed into a properly “enlightened” mind. So what truth did the Buddha realize all those years ago? At its simplest, we now know that our mind is affected by the Limbic system (aka “reptile brain”) and other structures in the brain which drive powerful emotions and urges. The Buddha did not believe that these urges and drives were “evil,” but he did understand that they needed to be integrated, managed, and understood within the context of a deeper understanding of a well-balanced existence. He understood that that a well-trained mind is able to resist every distraction and is able to delay gratification and reaction long enough to see the larger picture of existence. The Limbic system is our early warning system. It is focused on survival of one particular being – YOU! It is all about understanding what is “me and mine” and protecting that from everything and everyone else. It is from this deep place where dualism arises. The limbic brain is designed to react quickly in a “Flight of Fight” reaction. Of course, this is totally necessary in some situations – if you stick your finger in a socket, the limbic system is not concerned with broad issues in electrical safety – it is only concerned with eliminating the pain for you right now. Our practice, then, is about how to integrate the fight or flight urges coming up from the limbic system with our desire to understand the unity and integration of all existence. We want to leverage the limbic system where it makes sense, but we also do not want to be led by it. We don’t want to be the slave of every distraction or urge which arises in the mind. Tesshin mentioned that there is another brain structured called the pre-frontal cortex which performs this exact function. This part of the brain brings things and concepts together into wholly integrated systems. In our practice, we are trying to develop this part of the brain while at the same time denying “energy” to the more primitive limbic system. Tesshin mentioned that studies of the brains of accomplished meditators show significant structural differences from the general population – specifically structural differences in the pre-frontal cortex. Accomplishing the goal of training one’s mind and changing the brain takes a lot of focus and effort. This goal is not an easy one as one needs to develop focus while dealing with all the urges and distractions which our two hundred thousand year old “reptile brain” keeps sending our way. This is why our practice is not an instant solution, but rather a journey which takes a lifetime to complete. There is no final accomplishment in Zen – there is only the path. We incrementally improve the mind which means we develop the pre-frontal cortex while diminishing the limbic system. Every day on the cushion, we move the needle just a little bit. One can compare this with work in the gym. Showing up one day does not make you physically fit, but showing up every day for years pretty much guarantees the desired outcome. So, put your reptile brain on the cushion. Meditate every day to deny it power to run your life.